I don’t know about you, but I have a to-do list about a mile long. And however many things I check off the list, I never seem to get to the bottom. That’s why I’ve decided to try out a new approach. 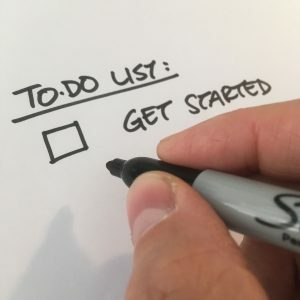 A to-do list with just one thing on it: Get started. You see, procrastination is something that usually kicks in before you even sit down to work on whatever you should be working on. Once I get started, I normally keep going until I have to go pick up my kids or cook dinner. I find that the resistance comes when there are too many choices, too many conflicting tasks. If you want to get in shape, I sincerely doubt that a complex workout plan is not going to be helpful. You want to make it easy for yourself, get some momentum going. Set a tiny goal like just get on the treadmill every day. Just get on it. And what are you going to do, just stand there? Might as well start moving. And just as a disclaimer; I don’t know anything about getting in shape. I’m not and never have been in any particularly good shape. That’s not the point. It’s the principle of just getting started and not setting too ambitious goals or have a thousand items on your to-do list. Maybe you just need the one checkbox. Want more productivity tips? Try giving this podcast episode a listen. “Just one item: get started.” I like that a lot! I also like what you said about momentum. Just start, and keep at it, even if it’s just a small thing, consistently. Bundles of quality content available, check how to write comics and how to make your comic book artwork look great or find tips and tricks on the blog. My book STILLETO released in the US today! Is the Free Content Model Hurting Artists? Win a Pentel Pencil Case! If you have questions or issues please contact us. Feel free to use the contact form or connect on Twitter and/or Facebook.